Eclectic Eye hosts its annual art show with a variety of paintings by local artist in the Memphis area. Eclectic Eye is an eye boutique that specializes in every aspect of eyewear from glasses, to frames, and even to personal consultation for eye exams or medical eye issues. They have been in the Cooper-Young area since 2002, by owners Michael and Robbie Weinberg. Owner Michael Weinberg is the main Optometrist and also a graduate from Southern College of Optometry, while wife Robbie Weinberg is the Director of Operations who obtained an art history degree from the University of Memphis. Both are Cooper-Young residents and are very active in the midtown life. Eclectic Eye supports the Cooper-Young community by providing free space to local artists to display their art work in their venue. This allows many customers to view the art work that aren’t seen at most art galleries, while attending to their eyewear needs. The profits that are earned from the art work goes directly to the artist, which enables them to continue their work and create more pieces. The Weinbergs are philanthropists in the Cooper-Young community. They provide products and services for silent auctions, they work with MIFA, collect school supplies for local schools, and they donate proceeds of their annual sales which are typically in February or early March, to Central High School, the owner’s alma mater. New art shows occur every six weeks, and they only feature Memphis artists. On the night of a new art show, the boutique stays open until 8:00 p.m. Eclectic Eye provides light hors d’oeuvres and beverages for those viewing the art and they have eyewear architects on hand to answer any questions about glasses. They provide some advertising for the artist and the opening of their show, but artists are mainly responsible for advertisement of their art show. The art work that is being displayed this month is by Carolyn Hope Clark called the “Inner Sanctum” and will be displayed through end of April. Local Memphis residents are encouraged to come. 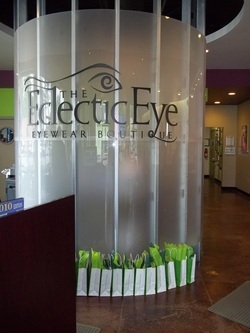 Eclectic Eye also has a second location in Collierville, TN., where customers may experience a unique eyewear boutique that will suitably fit their eye needs.